Once you experience cleansing, you’ll be sold! In my experience in practice at the Trust in the Process . Digestive Centre, what I found is that most people have no time to cleanse or detoxify, mainly because they have no experience with it. Even if they have a great interest the belief is that they have not time. What I’ve seen over the years is that when people do take the time they experience a great deal of benefits. The first thing that most people say is, they get more done and have a brighter clearer mind. Now they are more productive and are not spinning their wheels as often. The objection of making time in their busy schedule actually disappears. Then they have a desire to make a priority for cleansing and cleaning of the body. Once people experience cleansing, they are generally are sold on it! In this changing world, we have to realize it’s not the same world our parents grew up in. It’s like we’re being tricked every day, at least that’s the way I always feel. How many times do you read or hear something about a food or a damaging environmental chemical that is shocking to you? Our food production has changed; we’re eating foods today that if you saw the production yourself, you would stop eating it right away. We’re in contact with more chemicals than ever before; we eat more food today that is produced by chemicals than grown in the ground. You’re body is pushing back even if you don’t realize it. That’s why you are tired, sicker and fatter. Cleansing works well for healing illness or prevention because it releases your body from the burden of constant digestion and gives your organs the chance to flush out all those accumulated toxins. When you develop a regular schedule of taking a break from eating offensive foods or from eating solid food. Your tired and overworked body will get some very needed rest. Setting your body up for a good house cleaning is a time-tested practice. What you’re going to find below is a list of what a lot of people find when they do cleanses. Not everybody will get the same results. That is why there is a large list shown below. What, I can tell you is that everyone will get the healing needed. You might ask, how can you say that everyone will get what he or she needs. I can confidently say this, because when your body has a less toxic load and your food is nourishing and hydrating, then your immune system can work at its peak level to solve illness or prevent it. Gut-biome regeneration by lowering bad bacteria and adding probiotic growth. Your immune system can get over signaled. By cleansing your organs you strengthen the immune system. It’s kind of like at work when your boss gives you to much to do you tend to spin your wheels. Then when you have a juicy project to drive into you’re so pumped and really get the job done. Thinking if your immune system that way can make it clearer for you. Mild exercise will stimulate Lymph flow another avenue for your body to get the toxins out of the body. 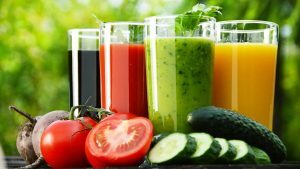 In the case of juice fasting being on an all-produce diet gives us not only the vitamins and minerals but the all-important phytonutrients that are powerhouses for the clean-up and healing process. Juices retain nutrients that would be destroyed by cooking, including some B vitamins and especially (digestive and anti-inflammatory) enzymes. Body defense mechanism: The body wants to keep your fat if it (the body) feels it is off balance. Just incase you get sick; it just might need that fat to stay alive. You get to review your long term eating habits. While doing a cleanse you realize you feel better with real foods and less foods. Skin rashes are really common in my office. They can show up in the form of Dermatitis, Eczema, Premature aging and wrinkled skin, Brown liver spots, Red itchy rashes anywhere on your body, deep painful rashes that can lead to ulcers, Hives, Psoriasis, Acne and Acne rosacea. Emotional issues are associated with skin issues. How many of you know when your family or friends are upset as soon as you see a blotch or rash on their face. It’s the first thing that I weave into my conversation, if a client arrives with skin issues. Hair loss or dull hair is also a direct reflection of your health. Most doctors will give you a visual look and see that as a sign that you are not well. Predisposition to a chronic disease due to genetics means you need to be more careful and keep your body low in toxic load. Once you have done all the cleansing and your still have health issues now a natural doctor can now see what is left to treat. The confusion of built up toxins is lower so it’s not confusing the health issue. You might not even have any health issues left. Wouldn’t that be a great result? Now you are on to living it up and doing all the things that you are passionate about. Helps to develop healthier habits around food and body movement. Once you have worked diligently to clean your body, you have an incentive to eat better and work out too. Have more energy to play with family or the hobbies you have always wanted to get involved in. Julia Ross in her book “Mood Cure” documents the connection to nutrition and depression. Cleansing and nutrition may not be the only answer to emotional issues and depression. It is how ever a wedge of the pie that is the answer. Colon Therapy! Should I really do that? How’s your Belly? Have Constipation, Pain or Bloating this Holiday Season? Does Your Belly Control Your Future? Let’s get right to the question – Why Cleanse my body? Do You Have Enough Bacteria? Constipation: Technique to Manage your POOing! Can’t Poo? Try This Smoothie.